Let’s face it, ladies, we have all fallen in love with a pair of gorgeous pumps that we just had to have for a special event only to find that by the end of the night we were carrying our stunning, foot-killing shoes instead of wearing them. 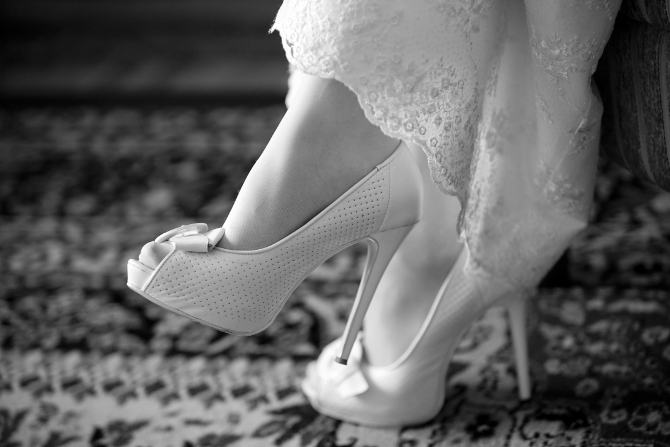 If you simply must have those over-the-top stilettos for your wedding day…go girl. You will look amazing and the crowd will definitely be impressed if you make down the aisle in one piece. But there are almost certainly other shoe options that will look great and feel a whole lot better. Let’s take a look at some ways your shoes can be incorporated into your special day besides simple appearances. What a fun and sweet memento…carrying tidbits of love, wisdom or signatures of those near and dear to walk with you down the aisle. Don’t forget using metallic or white paint markers to write on the grooms shoes as well! Be sure to utilize only permanent markers when spillng your soul on a sole. It’s such a special little touch! It could be a secret only the bride knows about, the perfect photo opportunity or a fortune telling exercise. Decide what feels best with your dress style and shop accordingly. If you have open heels and open toes, be sure to start moisturizing your tootsies weeks in advance and maintain especially after your pedicure for those picture perfect close-ups. The following tips from weddingideasmag.com are vital to take into consideration to ensure you find the right pair of shoes. Don’t wear your shoes for the first time on your wedding day. Make sure you have them a few weeks before the wedding and wear them around the house (on carpet) to get them worn in a bit before the big day so they’ve molded to fit your feet and eased up. Don’t panic if you can’t find shoes in the exact color you want. You can find shoe repair professionals to dye your shoes in a variety of different shades (useful for bridesmaid shoes too). 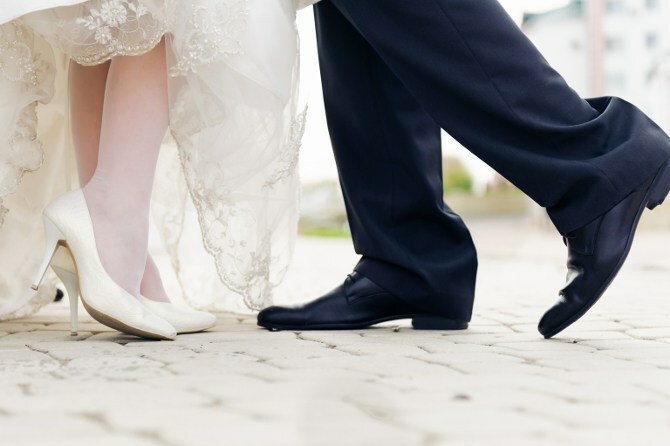 Whatever style of wedding shoes you choose, you will find the perfect dress to go with them at New York Bride & Groom of Raleigh. We are the premier bridal salon in the Triangle with a selection of designer wedding dresses that is unmatched in the region. Come browse our 17,000 sq.ft. modern luxury salon at your convenience (no appointment needed) and let our full staff of knowledgeable bridal consultants help you find the dress of your dreams.